As we've previously reported, the line-up for Tilburg's Incubate Festival, which takes place in venues across the city from 10th-16th September, is beginning to fill out nicely, with the likes of Chris & Cosey, King Midas Sound, Damo Suzuki, A Winged Victory For The Sullen, Laibach and Andy Stott already playing. Today they've announced a host more. First up is Consumer Electronics, the bracing solo project of Whitehouse's Philip Best. Like his former band, Best's approach with this project is one of overload, featuring his screamed vocals and waves of scorching noise. In addition, Darkwood will play a rare live show on Friday 14th September, and Drum Eyes, the furiously percussive crew led by DJ Scotch Egg and featuring former members of the Boredoms, are also set to play. 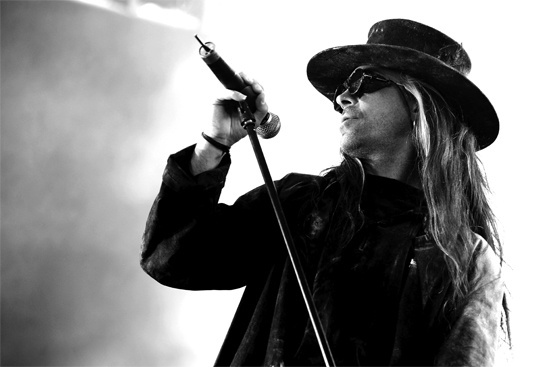 Incubate also announced an exclusive performance by Carl McCoy's legendary goth band Fields Of The Nephilim, their first in the Netherlands since 1988, who will be playing at the festival's largest venue on Friday 14th September. For more on the band's current activity, read our recent interview with McCoy here. They join the original line-up, as well as a host of other acts who were added last week, including MV&EE, Raime, Broken Heart Collector, Coldair, Dead Skeletons, Guilty, Dead Rat Orchestra and more. For more on Incubate, information about tickets and the rest of the line-up, head to the festival's website.